Ever Heard of a Pomegranate? Here is a fun recipe for your Thanksgiving dinner. This is a family tradition that has been around since I can remember...And since before I can remember. Every Thanksgiving has to have a Dixie Salad! This is unique because it has pomegranates in it. 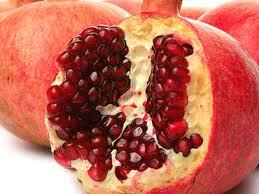 As far as I know you don't find pomegranates much in the year other than around Thanksgiving time. They are so different but taste so good! This salad is fast, easy, simple, and always tastes the best at Thanksgiving dinner! 1. Combine the apples, pomegranates, nuts and bananas into a separate bowl. 2. In a large bowl, whip cream until stiff peaks are just about to form. Beat in the vanilla and sugar until peaks form. Make sure you don't over-beat or the cream will become lumpy and butter-like. 3. Mix the cream with the fruit mixture. Chill in the refrigerator and enjoy! * Note: I never add the bananas because it's too much banana taste for me. So, if you don't want bananas in your salad you can leave them out or only add as much or as little as you want. An Asian shrub or small tree, cultivated for its edible fruit. T his many-chambered globular fruit has tough reddish rind, juicy red pulp, and many seeds.